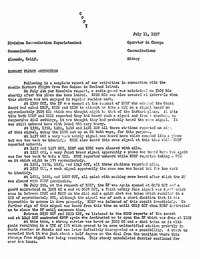 This report is from G.H. Miller, Operator in Charge, Midway Island. Following is a complete report of our activities in connection with the Amelia Earhart flight from New Guinea to Howland Island. On Ju1y 4th per Honolulu request a radio guard was maintained on 3105 KCs shortly after the plane due here landed. 6210 KCs was also covered at intervals when this station was not engaged in regular routine work. 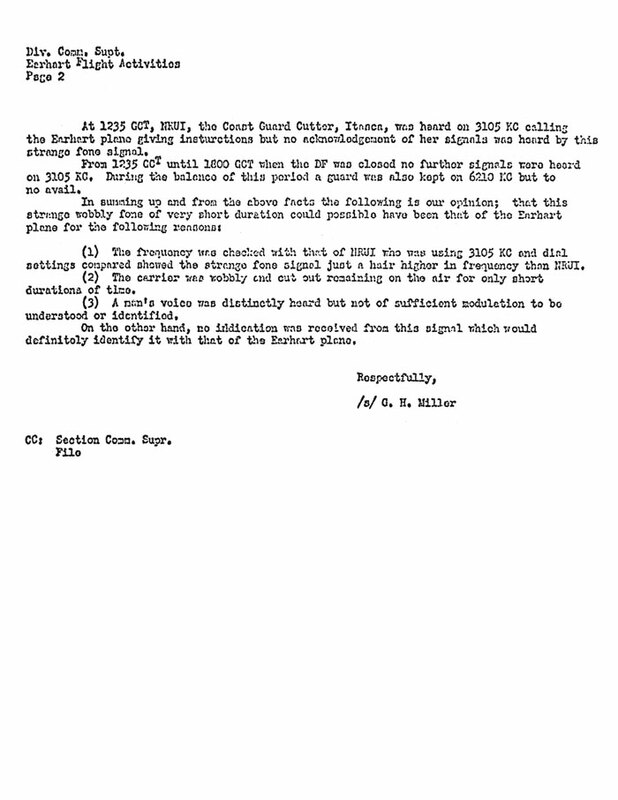 At 1320 GCT, the DF was opened at the request of KNBF who advised the Coast Guard had asked KNBF, KNBI and KNBH to attempt to take a QTE on a signal heard on approximately 3105 KCs which was thought might be that of the Earhart plane. 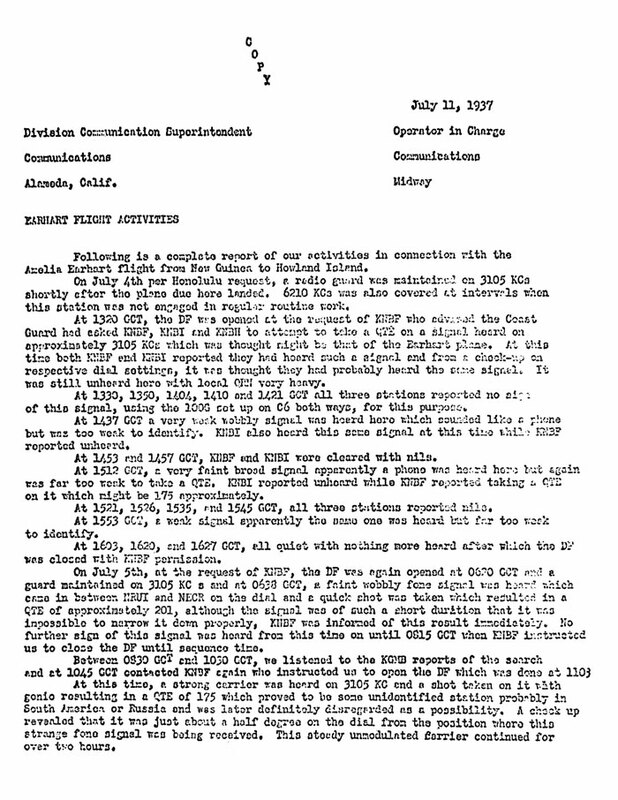 At this time both KNBF and KNBI reported they had heard such a signal and from a check-up on respective dial settings, it was thought they had probably hear the same signal. It was still unheard here with local QRN very heavy. At 1333, 1350, 1404, 1410 and 1421 GCT al1 three stations reported no sign of this signal, using the 100G set up on C6 both ways, for this purpose. At 1437 GCT a very weak wobbly signal was heard here which sounded like a phone but was too weak to identify. KNBI a1so heard this same signa1 at this time while KNBF reported unheard. At 1453 and 1457 GCT, KNBF and KNBI were cleared with nils. At 1512 GCT, a very faint broad signal apparently a phone was heard here but again was far too weak to take a QTE. KNBI reported unheard while KNBF reported taking A QTE which might be 175 approximately. At 1521, 1526, 1535, and 1545 GCT, all three stations reported nils. At 1553 GCT, a weak signal apparently the same one was heard but far too weak to identify. At 1603, 1620, and 1627 GCT, all quiet with nothing more heard after which the DF was closed with KNBF permission. 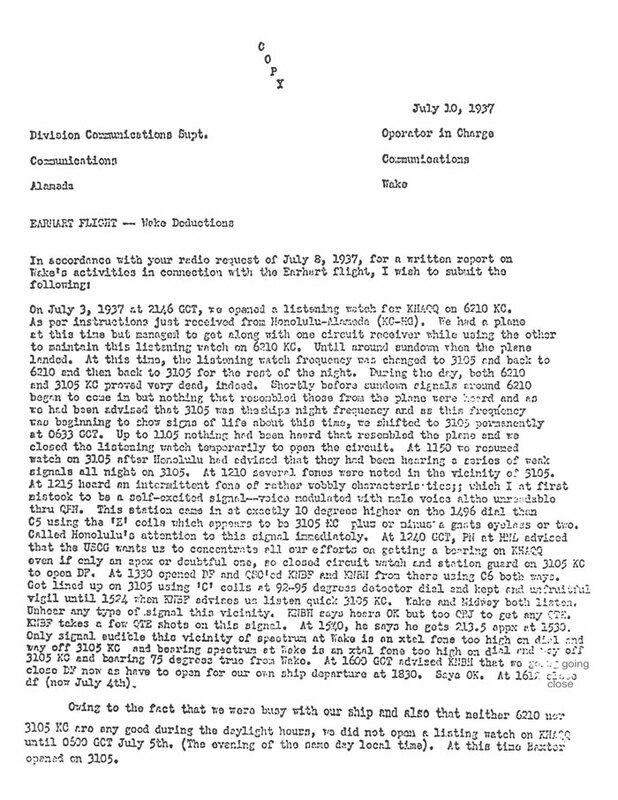 On July 5th, at the request of KNBF, the DF was again opened at 0620 GCT and a guard maintined on 3105 KC s and at 0638 GCT, a faint wobbly fone signal was heard which came in between NRUI and NECR on the dial and a quick shot was taken which resulted in a QTE of approximately 201, a1though the signal was of such a short duration that it was impossible to narrow it dowm proper1y, KNBF was informed of this result immediately. No further sign of this signal was heard from this time on until 0815 GCT when KNBF instructed us to close the DF until sequence time. Between 0830 GCT ond 1030 GCT, we listened to the KGMB reports of the search and at 1045 GCT contacted KNBF again who instructed us to open the DF which was done at 1103. 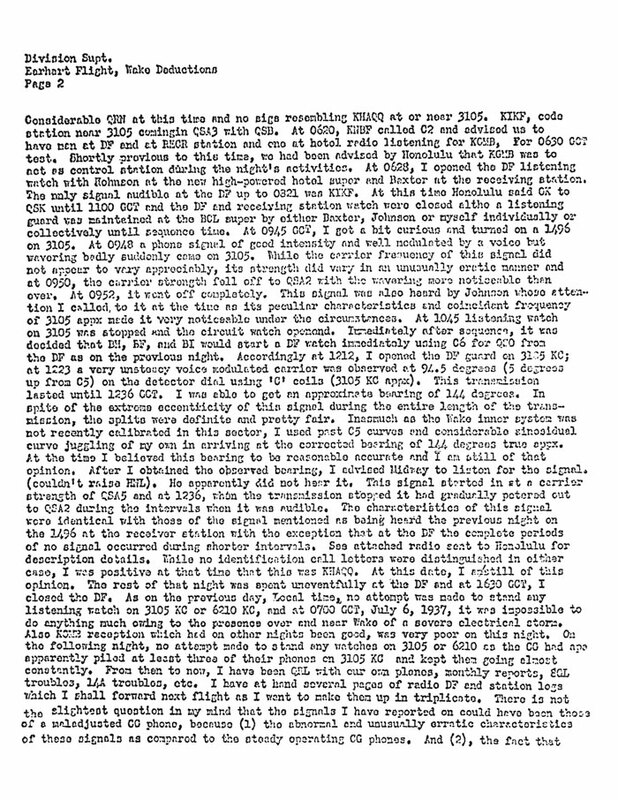 At this time, a strong carrier was heard on 3105 KC and a shot taken on it with gonio resulting in a QTE of 175 which proved to be some unidentified station probably in South America or Russia and was later definitely discarded as a possibi1ity. A check up revealed that it was just about a half degree on the dial from the position where this strange fone signal was being received. This steady unmodu1ated carrier continued for over two hours. At 1235 GCT, NRUI, the Coast Guard Cutter, Itasca, was heard on 3105 KC calling the Earhart plane giving instructions but no acknowledgement of her signals was heard by this strange fone signal. From 1231 GCT until 1800 GCT when the DF was closed no further signals were heard on 3105 KC. During the balance of this period a guard was also kept on 6210 KC but to no avail. (1) The frequency was checked with that of NRUI who was using 3105 KC and dia1 settings compared showed the strange fone signal just a hair higher in frequency than NRUI. (2) The carrier was wobbly and cut out remaining on the air for only short durations of time. (3) A man's voice was distinctly heard but not of sufficient modulation to be understood or identified. 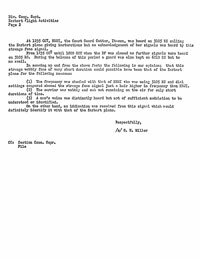 On the other hand, no indication was received from this signal which would definitely identify it with that of the Earhart plane.